The Battery Caddie is a convenient way to carry your extra hearing aid batteries. 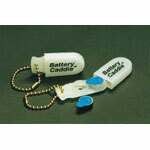 The Caddie holds 2 hearing aid batteries and has a convenient key chain design. It has a positive, locking closure so you won't lose your batteries.